I'm prone to connecting things that have nothing to do with each other, so this is yet another example of cloud catching. 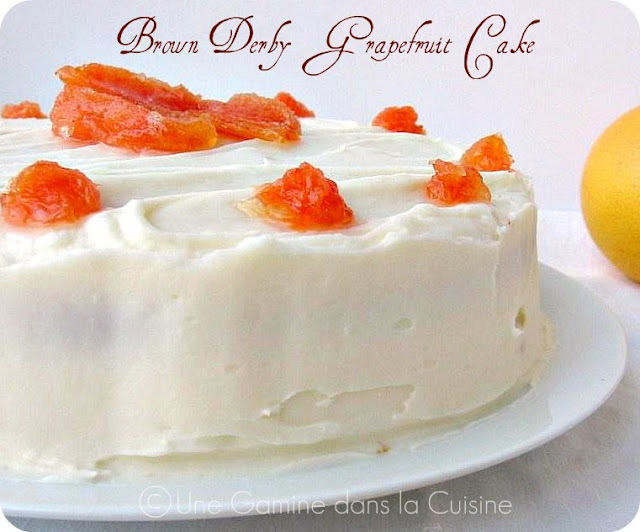 The Brown Derby is a famous restaurant in Los Angeles and the Kentucky Derby is on Saturday, ergo I wanted a friendly, edible version of the infamous race. Makes sense, right? I love horses, and because of that, I can't watch the Kentucky Derby (or any of the races for that matter.) Long before the 8 Bells tragedy, watching the race has always made me nervous. There's just too much speed in too tight a space, and I worry that my excessive worry will somehow summon enough worry-induced power that it'll actually make something happen. Is it wrong to feel more concern for the horses than the jockeys, and the people in their silly hats? I know it's tradition, but to me it just seems cruel. So I thought I would have my own version of a Derby, one that's animal friendly and won't result in injury (unless there is a mad-dash to get the biggest slice first.) As an added bonus, this would be a great Mother's Day cake! The cake is moist, fork-press worthy, and so unique. If you love citrus, this is a fun, perky twist on the traditional lemon cake recipes that are floating around. Plus there is some cream cheese action going on in the frosting. I don't know about you, but I could devour a batch of cream cheese infused frosting without bothering with a cake to put it on. This particular frosting has the sophisticated zing of grapefruit (which seems like the worldly cousin of lemons and limes.) As far as the garnish is concerned, you can certainly skip it, although this recipe was, by far, much better than my other attempt at candied grapefruit. 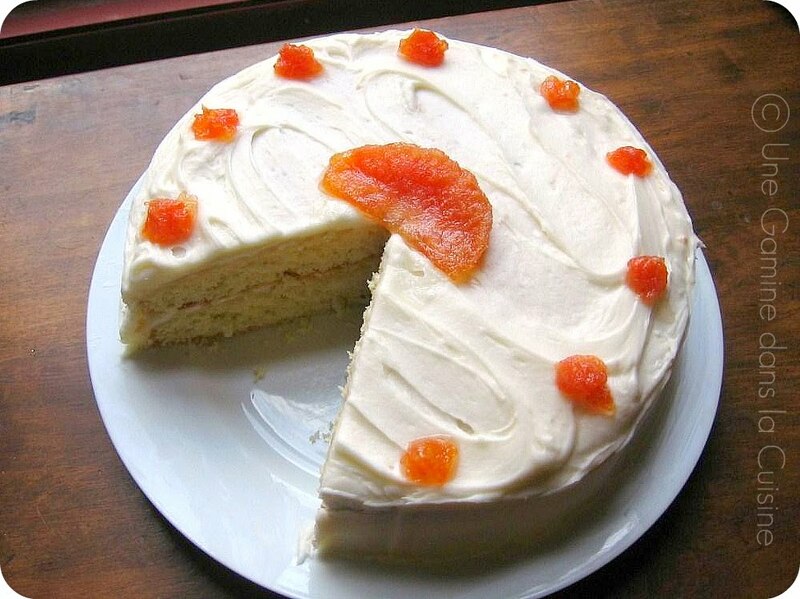 If you prefer, you can just slice up some fresh grapefruit and place the wedges on top of the cake. Whatever you decide to do, this Derby is much more palatable than the one occurring on Saturday. Cut ends off grapefruit to create flat surface on both sides. Cut peel off grapefruit in even strips from top to bottom, including only a small portion of pith. Blanch peel in 5–6 cups boiling water until peel softens, about 3 minutes. Drain and pat dry. Create simple syrup: In a large saucepan, boil 2 cups sugar and 2 cups water. Add the blanched peel to simple syrup and return to boil. Reduce heat to low and cover surface with tin foil. The candying process takes about 30 minutes. You can tell the peels are ready when they become translucent. Drain the candied peels on wire rack and cool until you can handle them. Coat the peels in sugar and let sit overnight. Store in airtight container. Preheat the oven to 350F. Grease 2 9-inch cake pans. Line the bottoms with parchment paper. 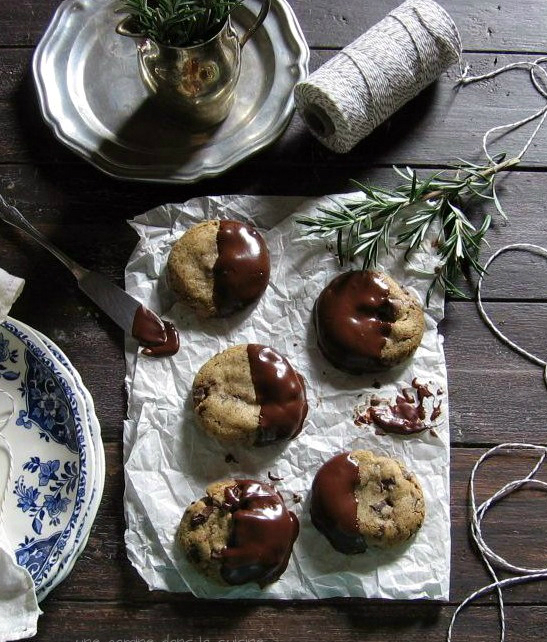 Grease the parchment paper and dust the pans with flour. Set aside. In a large bowl, sift together the flour, sugar, baking powder and salt. Set aside. In the bowl of your stand mixer, using the whisk attachment (or in any large mixing bowl, if using a hand held mixer), beat the egg whites (5 in all) and cream of tartar to a stiff peak and set aside. In yet another separate bowl, combine water, oil, grapefruit juice and fruit zests. Slowly stream water mixture into egg yolks. Fold egg-yolk mix into egg-white mix. Incrementally add dry ingredients to wet mixture. Try to be gentle, and don't over mix. Remove from oven and place on cooling racks. Let cool completely before removing from pans. In the bowl of a stand mixer, using the paddle attachment, beat the butter on medium setting until smooth (about 2 minutes.) Add the cream cheese and beat on medium speed until well blended. Add powdered sugar in 1/4-cup increments, making sure it’s thoroughly incorporated after each addition. Add the zest, juice and extract. Beat until the mixture comes to a spreadable consistency. Using an offset spatula, spread about 1/3 cup of frosting across the surface of one of the cake layers. Repeat with the 2nd layer. Carefully stack cakes by inverting frosted side of second cake on top of first. Gently press top so the two layers stack evenly. Frost exterior using remainder of frosting. Arrange the candied peel as desired, and garnish with slices of grapefruit. Slice and enjoy! Makes one 9-inch, double layer cake. Divine looking! I am a sucker for citrusy baked goods and icing. Yes to the cream cheese icing! Like all of your baking, this cake looks wonderful. I love the Derby tie-in, and I'm just sorry there was no Roller Derby angle. Next year, maybe? I love grapefruit, but I don't think I've ever baked with it. 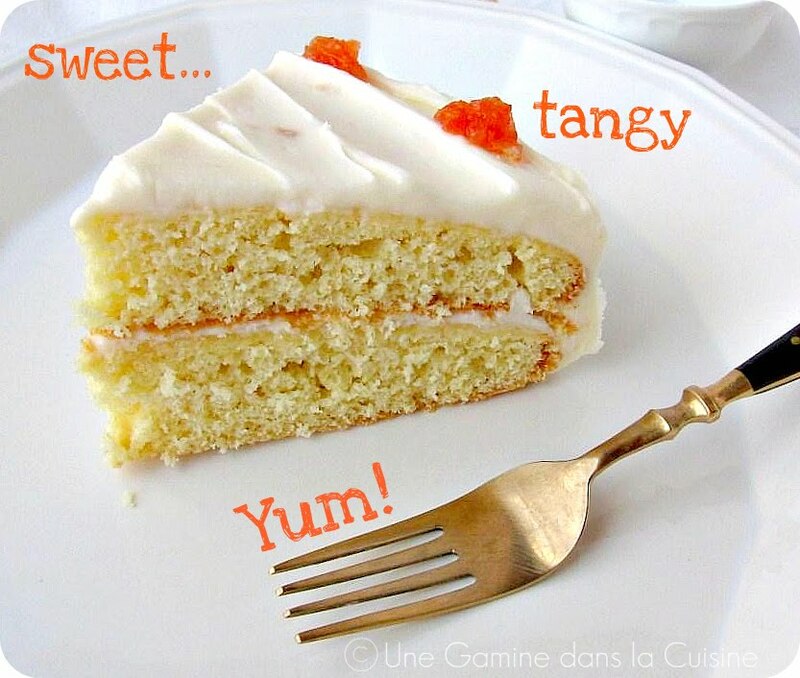 The cake looks glorious, and I'm glad you and the grapefruit peel made peace! I can't watch the derby either, and I'd much rather be eating this cake anyway. Now I'm wondering what to make for Mother's Day! Looks so springy and beautiful. Lovely shots too. Buonissimo e bellissimo Valerie ! I wish I could come over and get a slice ! I have been wanting to try this exact recipe for about a year, but never got around to it! Your cake looks fantastic and I'll bet it was just delicious. From one Valerie to another this sounds like a special way to celebrate mom.